Unicorns aren't really that hard to find! Of course, maybe we have a perspective that's slightly different than the norm. Because we deal with unicorns on a daily basis! If you don't have the fortune of working for a world-renowned costume company, then perhaps you should take things into your own hands. You know, like, that you could be the unicorn. Think about how much fun that would be! Of course, it doesn't have to be just fun. It will be relaxing and pretty comfortable, too, when you choose this Teal Unicorn Yumio! These plush pajamas are ready for a party, but they work equally as well for lounging around, or for funky everyday wear to really shake things up. 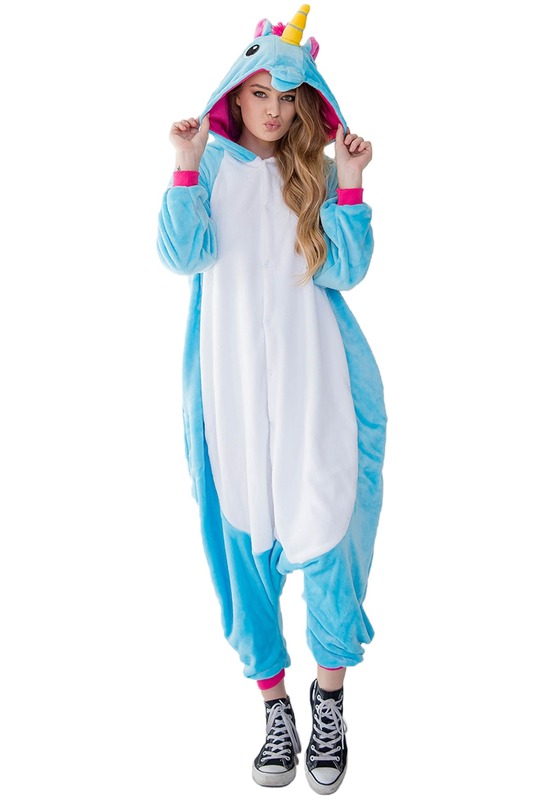 You know you'll really make a splash at school or work when you show up in a unicorn onesie! An authentic Yumio from I Love Yumio, we're proud to carry this fun pajama set. 100 percent polyester, it has a super soft, flannel plush feel that will keep you warm and cozy. Button closures secure up the front so it's easy to take on and off. 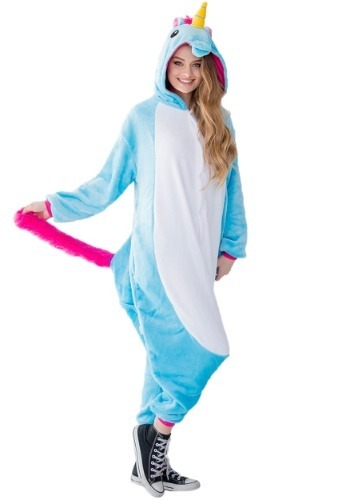 The hood features three-dimensional unicorn facial features like a nose, mane, ears, and horn! Designed to fit loose and comfortable, this Yumio is sized for adults, and designed to fit most people between 5’ and 6’ tall, up to 240 pounds. Frankly, we can't think of any situation where wearing this Yumio would be inappropriate. Sure, it will work extra great for a costume party or for dressing up on Halloween, but we're sure you'll find it so comfortable that you'll want to wear it all the time. Start with wearing it around the house, and then start wearing it when you go out on the town! We're sure all the folks you meet are going to be super excited to meet a real unicorn!